La Hacienda has brought its brand of family-fueled Tex-Mex to the northern ’burbs. : La Hacienda is the way-uptown offspring of the original Los Barrios. 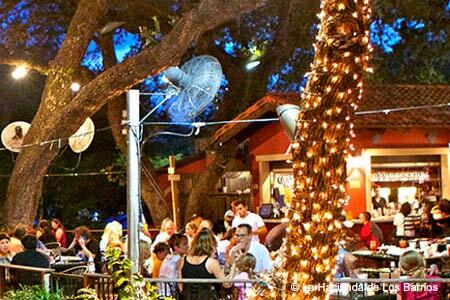 The tree-shaded setting has been the scene of a Bobby Flay Food Network throw-down with owner Diana Barrios. (Her puffy tacos bested his.) Yet even if this location is classier and the clientele newly affluent, many dishes pay homage to the original restaurant. Nachos a la butler with beans, picadillo, guacamole and cheese top the appetizer menu; they and the fried jalapeños are naturals with margaritas. The selection of top-shelf tequilas is among the best in town, in fact, and a shot or two could be a compañero to camarones al ajillo with garlic and chiles or the shrimp-stuffed chile relleno. But when it comes to the classic cabrito en salsa, stick to a traditional Mexican beer such as Negra Modelo. For dessert, first order the prodigious empanadas stuffed with guava paste and cream cheese --- only then should you consider the house-made sopaipillas served with honey and dusted with powdered sugar.